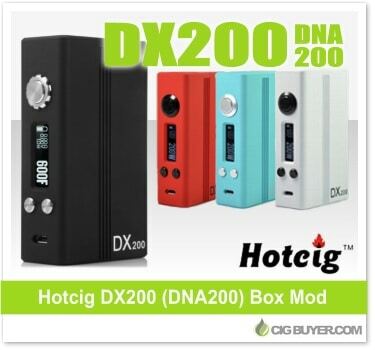 One of the long list of devices incorporating eVolv’s DNA200 chipset, the Hotcig DX200 Box Mod is loaded with power and all of the unique features offered by the DNA 200. It offers up to 200W of output, preheat, synchronous rectification, temperature protection and so much more. Powered by a built-in 900mAh battery that can be easily detached and swapped out, it includes a large, full function OLED screen, spring-loaded 510 and USB port for charging and using eVolv’s eScribe software to customize or monitor your experience.